If gingerbread cookies aren't your thing, how about some gingerbread toffee? 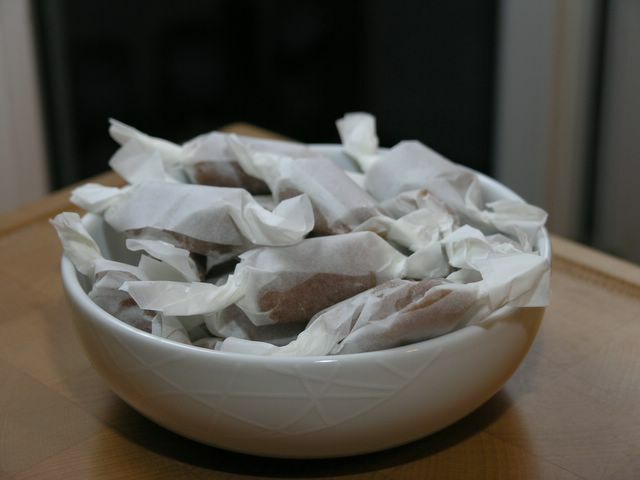 This makes a soft, chewy toffee - you can cook it for longer if you want a harder toffee. Make a small form out of greaseproof paper, or use any small form and grease it. Mix all ingredients in a small saucepan. Bring to a boil, and boil on low-medium heat until you reach 122-125 °C. I strongly suggest using a thermometer, but if you don't, it's done when you can drop a little of the batter in cold water and roll it into a soft ball. This takes different time in different saucepan, but estimate 20-30 minutes. Or so. Pour the toffee carefully in your prepared form, and let it cool. When it's cold, but before it's rock solid, cut into suitably large pieces, and roll up in greaseproof paper. Åh så gott. Hamnar på önskebaklistan inför jul..
That looks so good. I love anything toffee and caramel. I worked in a Swedish store where they sold these candies - when the store closed I could not afford to get them shipped and there were no recipes anywhere...then I found your recipe and I have made them every year for Christmas for the past 5 years and followed your blog ever since - thank you for sharing!